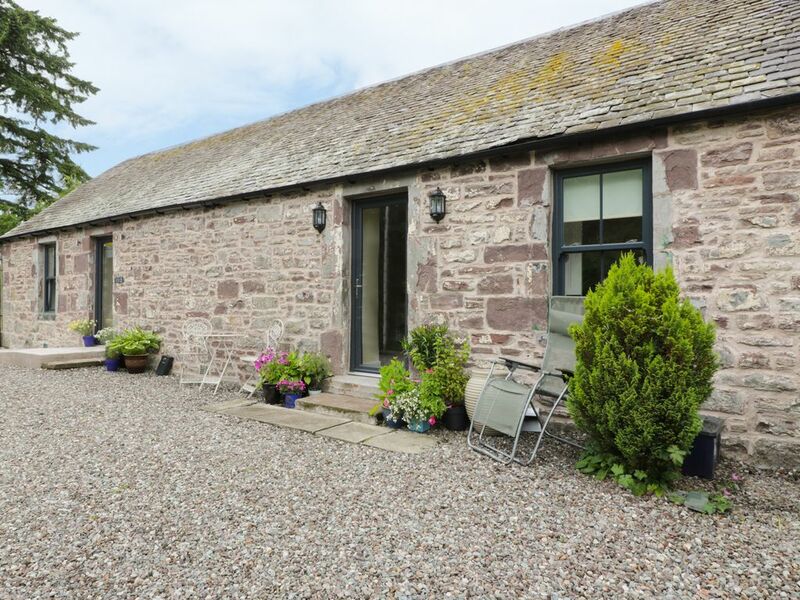 The Garden Cottage is a delightful end terrace cottage situated in the owner's castle grounds near to the town of Dunblane. The cottage can sleep four people in one double with ensuite facilities and one twin with ensuite facilities. The rest of the cottage is made up of an open plan living area with a kitchen, dining area and sitting area. To the outside of the cottage is off road parking for two cars and a gravelled area to the front with garden furniture. Set in beautiful surroundings, The Garden Room is a lovely cottage to be enjoyed throughout the year. Amenities: Oil underfloor heating. Electric oven and hob, microwave, fridge, TV with Freeview, DVD, WiFi, selection of books, games and DVDs. Fuel and power inc. in rent. Bed linen and towels inc. in rent. Off road parking. Front sitting area and access to owner's castle grounds. Sorry, no pets and no smoking. Pub 2.5 miles, shop 3 miles. Note: Mobile phone reception is very limited at this property. Note: Cot and Highchair available. Note: Steep gorge down to river close to property and children should be accompanied at all times. Note: This property has a private water supply. Region: From the lush green farmlands of the Borders to the ruggedness of the Highlands, the Scots are proud of their land and identity. Scotland also has some of Britains best beaches with glorious stretches of clean sand over which to roam. Town: Dunblane is a small cathedral town situated six miles north of Stirling. Its main landmark is Dunblane Cathedral and the Allan Water runs through the town centre, with the Cathedral and the High Street on the east side. The nearby town of Bridge of Allan is a former spa town at the foot of the Ochil Hills near Stirling. Today, the main street bears Alexander Hendersons name and the town is prosperous and home to Stirling University, a golf club and many shops and restaurants. So much of central Scotland is within easy reach of Dunblane, and it has good road and rail links to Glasgow, Edinburgh and St Andrews. The area is a haven for walkers, cyclists, anglers and nature lovers, and golfers are well served with Gleneagles about 20 minutes' drive away, along with Carnoustie and St Andrews, about an hours drive away. The Ochil Hills are on the doorstep, and Loch Lomond and the Trossachs National Park a short drive to the north. Dunblane offers an excellent central touring location, while closer to home is the historic, of Bridge of Allan. All ground floor. Two bedrooms: 1 x double with ensuite bath, shower over, basin and WC, 1 x twin with ensuite shower room with shower, basin and WC. Open plan living area with kitchen, dining area and sitting area. Oil underfloor heating. Electric oven and hob, microwave, fridge, TV with Freeview, DVD, WiFi, selection of books, games and DVDs. Fuel and power inc. in rent. Bed linen and towels inc. in rent. Off road parking. Front sitting area and access to owner's castle grounds. Sorry, no pets and no smoking. Pub 2.5 miles, shop 3 miles. Note: Mobile phone reception is very limited at this property. Note: Cot and Highchair available. Note: Steep gorge down to river close to property and children should be accompanied at all times. Note: This property has a private water supply.